Ostara Sabbat rolls around as the sun enters the sign of Aries, between March 20-22, and initiates the season of spring. Ostara is the Spring Equinox, the liminal time, or the gateway time holding in the balance the ending of Winter and the birth of Spring. This is a low ebb in the flow of energy on The Wheel of the Year, and so is considered a quarter, or lesser sabbat. Yet is always a welcomed moment to bid adieu to Old man Winter, and welcome in the fresh breath of Lady Spring. The mythos at this time tells the story of the Maiden Goddess, Persephone, Ostara, Eostre, fully returned now from her underworld journey, who steps foot upon the earth again and with each step, the snows recede and the sprouting seeds break through the surface of the earth. As the world awakens, the branches budding out, the Goddess too, blossoms into her full womanhood as the flowers that rise, opening their eyes, lifting their faces into the golden dawn. The Lad, the Jack of the Green, the Stag grown strong, entering manhood as the sun strengthens, and the animals of the wild emerge from their deep sleep to seek out their mates, and feather their nests. 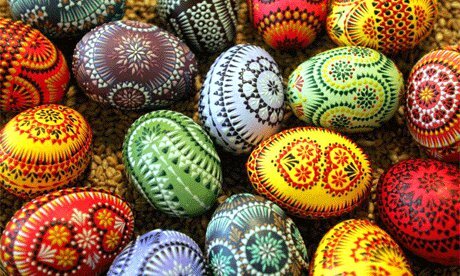 It is the time of the hare, fertility, and for gaily colored eggs shared as a blessing between friends and neighbors. Here are a few of my favorite spring time dishes to try for your Ostara sabbat feast. 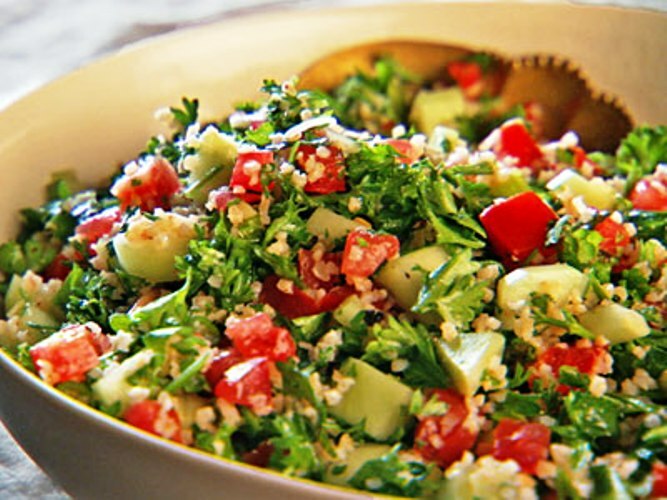 In large salad bowl, layer ingredients in order that they are listed. Serve with Citrus and Seed salad dressing. In a blender, blend the onion, green pepper, celery, tamari and tahini. Add the lemon juice, pepper and oil and blend on high speed until smooth. In large mixing bowl, add Bulgar wheat and the boiling water and let it sit for 30 minutes. Meanwhile, chop and add your green onions, parsley, mint and tomatoes. Mix everything together with the remaining ingredients. It is best if let sit for a while prior to serving. Scoop the yellow yolks of the eggs into a wide, flat bowl and mash with a fork. Add all the rest of the ingredients except paprika. Mix thoroughly with a spatula. Taste it and see if you like it…adjust as needed. Too sweet? Add a bit more salt. Too sour? Add a bit more pickle relish or sugar.Want more ZIP? Try a bit more vinegar. I like my eggs pretty zippy. Take a gallon zip lock bag, stuff a corner of it into an empty coffee cup and fold down the top of the bag over the edge of the cup. With the spatula, shovel all the mix into the bag, using the edge of the cup to scrape the spatula clean. Close the bag, squishing all the mix into one corner, burping the bag for any air bubbles, and sealing shut. Twist the bag to push down the mix and use like a pastry bag. Cut about a half inch corner off with the scissors, and squeeze the mix back into the eggs, using a bit more than the indention will hold, until all gone. Sprinkle a bit of paprika on each egg as a garnish. This entry was posted in Modern Witchcraft, Sabbat Recipes, Sabbats, The Great Work and tagged Modern Witchcraft, ostara, Pagan, paganism, recipe, sabbat, spirituality, Wicca, wiccan, Witchcraft by Heron's Rook. Bookmark the permalink. 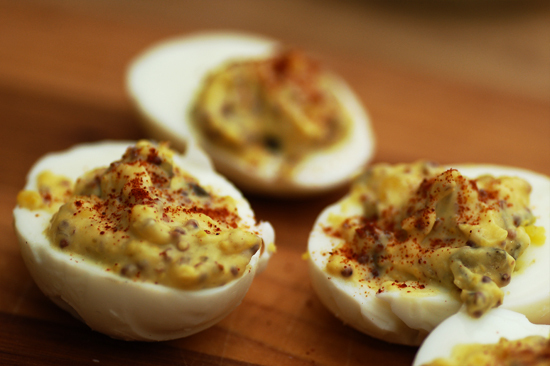 so, I just now found this (bad witch no cookie.. totally unaware of my surroundings and in my own head).. but you know deviled eggs are seriously my favorite food so I will be all over this recipe.. never thought to try vinegar. Morgan, so glad you found me! I think the fact that I come from a long line of German forebears accounts for the presence of both pickles and vinegar in all the family recipes. I LOVE IT! Here is another tip, should you happen to have any Bread and Butter pickles around, save the juice and spices from that jar and add some of that to the recipe in place of some of the vinegar and sugar, though be careful not to make it too soupy. Enjoy!